Summary: Bone is the compilation in one volume of the series of nine graphic novels by Jeff Smith. 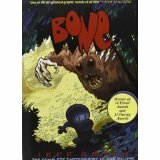 It tells the story(s) of the three Bone cousins (Fone Bone, Phoney Bone, and Smiley Bone) and their adventures in a mysterious valley they find after being run out of their town of Boneville. As they continue they meet different people and many interesting characters (dragons, talking bugs and animals, etc.). The real adventure begins with Fone Bone (the principal hero) meeting and becoming friends with a young woman named Thorn and her grandmother. They live on a simple farm and raise and race (yes, I said race) cows. Just an FYI, when I say race, I mean that the grandmother, Grandma Ben, actually races against the local cows….and wins. However, as with all books of this nature, they are more than meets the eye. There are rat creatures searching for the Bones, specifically Phoney, and their leader, The Hooded One, will stop at nothing to capture him. The Hooded One wants to release the evil Lord of the Locusts from his captivity and take over the world using Phoney as a sacrifice. As can be expected, Thorn and her grandmother are the ones who can prevent this as they are members of the royal family believed to be long dead as well as powerful in the spirit elements at work in this world. The Bones, especially Fone Bone, are key participants in this battle between good and evil. They travel far and wide throughout the valley and the former kingdom in this epic struggle which comes to its conclusion in a final, climactic battle. Full of intense action, some scary images, and genuine laugh out loud moments (my wife looked at me with concern during one) this book(s) will appeal to most. Literary: This is a graphic novel that deals with many elements of fantasy. Talking animals, magic and supernatural elements are throughout the book. This one volume is in black and white (as each comic was when first published) which can give sharp divides between those who are evil and good, but also allows the imagination to work. Currently, novels 1-9, published individually by Scholastic, are in color. The characters are portrayed with many layers, much like real people. All of the characters have a past and they are trying to determine how that past can help or hinder the present situation. Race/Gender/Culture/Economics/Ability: This book has recently been on the banned books list for being racist. The first reason I can find is where characters are referred to as Flatlanders (valley dwellers) by those who live in the mountains. This is a primary source of tension used by The Hooded One to gather an army to fight and help release the Lord of Locusts. The portrayal of the Rat Creatures is a second reason. These creatures are viewed by others in the story as not worthy of life, yet they are shown to have a complex society with ancient temples, beliefs, customs, social structure and even a king. There are several points where religious views are viewed negatively and actually outlawed by leaders in the city. This makes a difference as Thorn is arrested and thrown into prison for her belief in dragons and her following of the old ways, when she is one who can defeat the Lord of Locusts. Gender, particularly female, is portrayed well in this book. There are very strong female characters in Thorn and Grandma Ben who can handle any situation that comes. They are the equal, if not the better, of many of the men in the story. Both are strong not just in physical strength but in being human, willing to admit mistakes and asking for help when they need it. Theological conversation starters: This book draws connections in several ways. There is forgiveness of Phoney by Fone Bone for several schemes gone wrong. There is the sacrificial giving of life by a character to save another. There is the stand against evil when it would be easy to join forces and gain great power. The Bible stories of forgiveness and Christ’s sacrifice could be used here. Also, the stories of those who have stood when it would be easy to stay quiet or join (Daniel 3). Can you find any parallels between Bone and the Christian story? Have you ever been in a situation where you did something you thought was for the best only to find out it was not (similar to Grandma not telling Thorn about her past)? What happened? When in this book does someone correct a wrong that was done earlier? Where are there sacrifices made or offered? How is evil portrayed in this book? When some speak of “spiritual warfare” today, what comes to mind? Bone by Storypath is licensed under a Creative Commons Attribution-NonCommercial 4.0 International License.